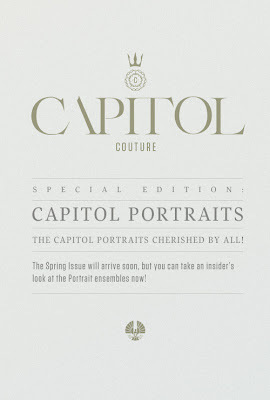 Home » » CapitolCouture.pn Update - Spring Issue! CapitolCouture.pn Update - Spring Issue! An exciting update from capitolcouture.pn has just been shared on their Tumblr blog. The spring issue is coming soon! "The Capitol Portraits cherished by all! - The Spring issue will arrive soon, but you can take an insider's look at the Portrait ensembles now!" We are very excited to see what's in store; perhaps there could be some new portraits?! Keep a close eye on capitolcouture.pn in the coming days..
What do you want to see in the spring issue? Let us know in the comments below!